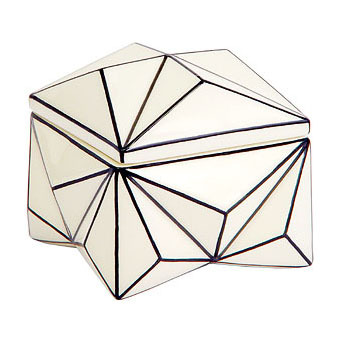 No other object captures the spirit of Janak's early cubist works better than this crystal-inspired box. Probably produced as a one-off, the box is a complex composition of angles, sharp points and folded planes. The thin black lines complete the dynamic sculpture and distract from its basic function as a box. Material: earthenware, cast, hand-painted, glazed.